The trick to planning and pulling off successful marketing events is to make sure they grow organically out of your business. You don’t want to tack an event onto your brand without giving any consideration to what your brand means, who your customers are and why you’re hosting the event in the first place. 2. Interactive Events. People love to interact with products and get to know a company’s employees, and events give them a chance to do that. For this event, set up hands-on stations where they can see how things work or give them a chance to see your services in action. A video editing company, for instance, might offer customers the opportunity to edit clips onsite, letting them see how the process works and why it’s so valuable to them. 3. Travel Events. Arranging to take your customers on a trip—even if it’s a nearby destination—gets them out of their daily routine and gives them the chance to explore your products and services in a unique setting. Think about booking a weekend trip at a bed and breakfast or retreat center, and then organize your days around product demonstrations, customer interactions and activities. 4. Just-For-Fun Events. Not all events need to relate directly to your products or services; some can just be for fun. You could organize a family fun day in your parking lot, complete with an inflatable bounce house, games and a snow cone machine, and then invite your customers to bring their family for the day. 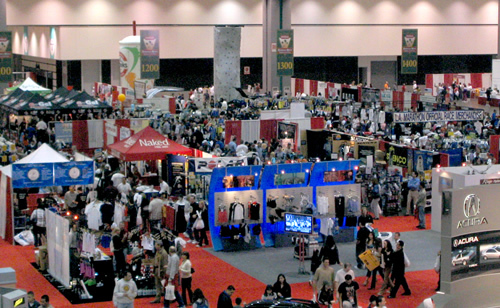 These kinds of events work particularly well for family- and children-oriented businesses. They get people to relax and enjoy themselves, and also create a good vibe around your brand. 5. Lecture Events. Reserve a seminar room or conference center, and bring in a well-known speaker who can talk about issues related to your business or service. A reception afterward gives you a chance to network with customers and prospects, and gives those attending a chance to talk about the ideas generated at the event. 6. Fundraising Events. Raising money for a charity that’s related to your business is a great way to create positive feelings about your brand and also do your part to help change the world. People will be happy to buy tickets or donate money when they know it’s for a worthy cause, and the synergy of a charity event can help people see how your business isn’t just all about business. 7. Adventure Events. Reserve the local rock climbing gym, organize a 5K or arrange a hike in a local city park. All these events, under the sponsorship of your business, give people a chance to get to know you and your employees in an environment that has nothing to do with business. 8. Networking Events. Everybody knows the value of networking, and these kinds of events can benefit both you and your customers. A simple cocktail hour at your business’s location or at a local wine bar or microbrewery will give customers the chance to meet others in the field and related fields. It will also help make your brand stand out from the crowd. 9. Virtual Events. Not all events need to be in-person activities. Social media and other interactive platforms give businesses the opportunity to reach out to customers and clients virtually. Such events can include webinars, call-in sessions, Facebook contests or any other use of organized space and time that brings people together electronically with each other and with your business. 10. Tandem Events. Partnering with like-minded businesses and suppliers can benefit both you and your event partners. Brainstorm with others in your field or with complementary businesses to see what type of events you can put on together. For instance, if you own a hair salon, what about finding a day spa, nail salon or beauty supply store that would join forces for a “day of beauty” event? Partnering with another business increases the number of potential new customers you’ll both attract. Event marketing can be challenging to pull off, but done right, it’s worth the extra effort. After all, who doesn’t enjoy trying new activities? And it’s a sure bet your customers and prospects will remember your marketing event far longer than they would a brochure or email campaign.